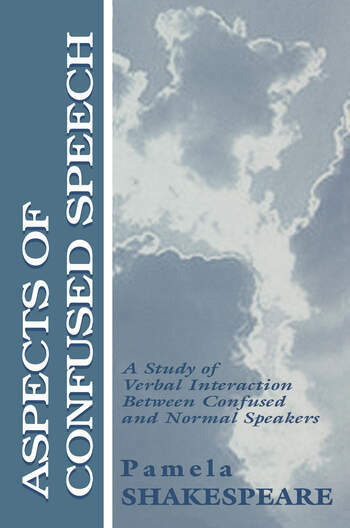 Based on research focusing on the experience of having confused speech and being with confused speakers, this book begins with everyday, commonly understood ideas such as "talking too much" and examines how confused speech is "brought off" as a collaborative activity by the people involved. The author became involved in this project because she was interested in how "confusion" seemed to be something that everyone is not only involved in but also recognizes as part of ordinary life. At the same time, "confusion" is a word that is used somewhat as a blanket category for some people considered permanently incompetent and "set apart" from ordinary members of society. Her study analyzes how talk between confused and normal speakers throws light on this tension. Contents: Introduction. Confusion, Normality, and Everyday Life. Assembling and Processing the Data. Openings. Minimally Active Confused Speakers. Moderately Active Confused Speakers. Very Active Confused Speakers. Getting Confused? Appendices: Research Participants. Transcription Conventions. Tilly's Story. Lunchtime at the Bruner's. "Shakespeare has turned a careful investigation of a set of disordered talk into a clear and articulate commentary on what it is to be normal. She shows, with respect, humanity, and analytic rigour, how the confused speaker faces a severe test in coping with the trouble that every speaker must handle if they are to pass as ordinary members of society."